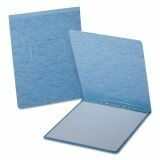 Oxford PressGuard Report Cover, Prong Clip, Letter, 2" Capacity, Light Blue - Report cover is made with heavy-duty 20 point PressGuard to resist oil and moisture. Strong reinforced tape on top-hinge provides extra protection. Design also includes a built-in 2 prong fastener and embossed title panel on front cover."